Why am I able to proudly display the following logo on my Blog! 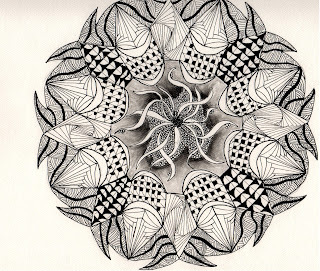 Around the beginning of the year my wife sent me an email message telling me that there was going to be a class for something called Zentangle® at the studio run by her massage therapist. She asked if I wanted to go, I kind of waffled, looked it up online, talked with my wife about it, and we decided we would go try it out. The class which was held by Sheryl Lamarand, had me hooked, by the end of the first class I decided to sign up for the second class a month latter. After the second class Sheryl said the next class would be a Zendala class, I was curious we had done a Mandala activity at my company retreat the year before, and the sparked an interest in mandalas. The Zendala class set the hook that had been planted during the 1st two classes. I loved the creation of the Zendala, and how the simple patterns worked together to create the amazing mandalas the students in the class created. Shortly after this class Rick and Maria posted that there would be two CZT classes this year, I quickly emailed Rick and arranged attending the class held in August 2012. Below is the Zendala that I created in that third class, the creation of this is truly the reason I am a CZT today. 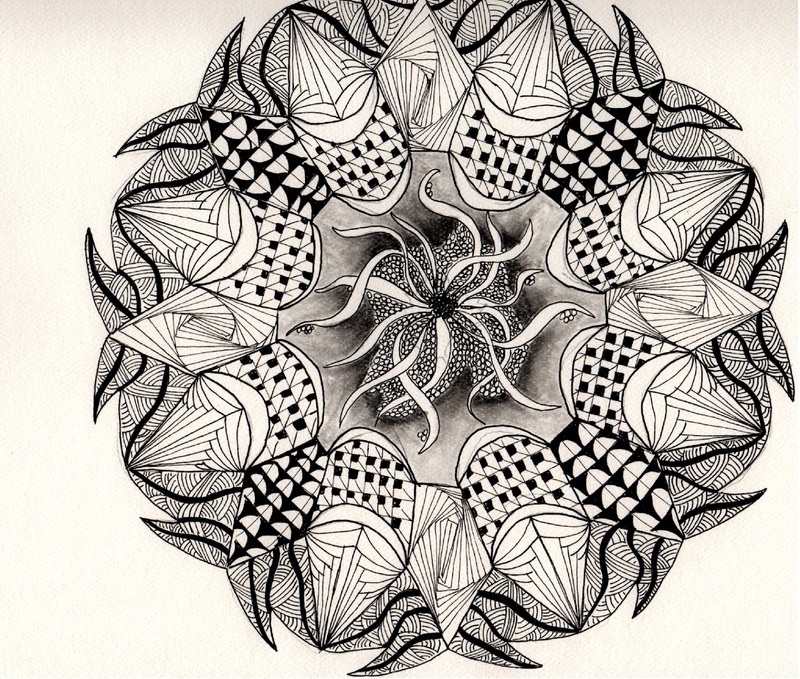 Though I have not been tangling as long as other, I have developed a deep love of Zentangle, the art, and the creation process. This is a photo of the Zendala shortly before it was finished, after this photo I added just a touch of shading and blackened in the white crescents. pretty amazing work! hard to believe it was your 3rd class :) you obviously have a knack for it!